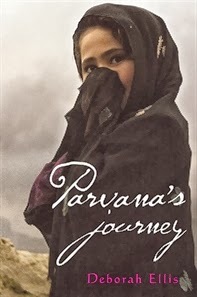 Parvana’s Journey was the best book I have ever read! It was absolutely amazing! When I picked up The Breadwinner (which is Deborah Ellis’ other book), I looked at the cover and thought “this is going to be boring”. When I actually read the book I was so shocked at how good it was and here I am now sharing with you my book review on the second one – and this one is even better!! I think that Parvana’s Journey is a good sized book and is just right for our age. The book was very detailed and I think that Deborah Ellis is very good at hooking people in to her books. I just wanted to read more and more and I think you will want to too. The characters in this book are very interesting. The main in this book I think, is Parvana. Parvana is very brave and smart. She is very handy and knows how to look after kids very well for a girl her age. She knows how to survive by herself. All the other characters I will let you find out for yourself. Parvana is out on a great journey to find her Mother and siblings. She has gone far and wide trying to find them. She started the journey with her father but at a camp they were staying at, her father died. Scared away by the message that the Taliban were coming to get her, she continues the journey to find her family while meeting some strange people along the way. There were not many bad things in this book but what I noticed is that the book ended very quickly. I was reading and enjoying the book when suddenly the book just basically ended. I thought there could be a little bit more to the end. Also at the end it was very sad. I thought that too many people were dying at the end of the book. There are so many good things in this book that I could go on forever! I will just say what really stood out. Well, the book was very descriptive and interesting. I really like how Parvana writes small letters to her best friend. I thought this book was amazing! I can’t wait to read Deborah Ellis’ two other books Parvana and Shazia. I really enjoyed reading this book. I give this book a 5 out 5! - This review by Ashley Morgan, a member of the St Mary's Catholic Primary School Kalgoorlie Book Club. KBR Note: The Breadwinner was published in Australia by Allen & Unwin with the title Parvana. Wonderful review, Ashley. It's so important to read books that make us realise how fortunate we are! and to extend a hand to those in need. Thank you for such a wonderful review, Ashley. It sounds like this book really drew you into Parvana's story. I'm glad that you will be looking for more books by this author.